Blog | May 2018 | Trimcraft’s Monthly Craft Summary for April, Plus Monthly Competition Winners! Trimcraft’s Monthly Craft Summary for April, Plus Monthly Competition Winners! 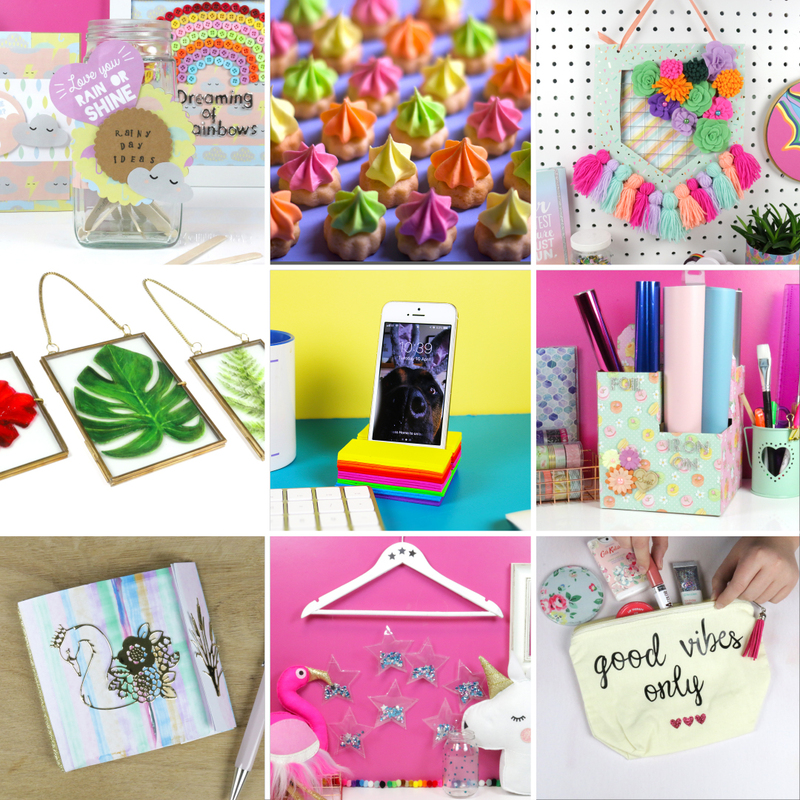 April was the month of DIY and everyone’s had lots of fun creating new and wonderful projects, from colourful organisational craft to deliciously sweet iced gems! With so much to choose from, why not scroll through our amazing selection of tutorials and give something a go? We’re sure you'll find a sneaky template or a free download to inspire you here! Keep reading to find out our Top 9 crafts from April, as well as the winners of our Monthly Competition, Craft of the Month, and Project of the Month! We started the month with a super cute pack of free papers inspired by the April showers we’ve had. These papers are bursting with pastel umbrellas, vibrant rainbows, cute clouds and little lightning bolts perfects for creating some amazing and unique projects! We also included some free sentiment toppers for the perfect finishing touches to your lovely creations! Earlier this month Elle recreated a childhood favourite with these super sweet iced gems! With their zingy flavours and rainbow colours they are sure to be a great choice for parties or even just a snack through the spring and summer months! The best bit is… they are so easy to make! Maxine showed us a fabulous way to display notes and photographs whilst adding a sprinkle of floral fun with her DIY succulent notice board. This is perfect for showcasing your memories and important to-do lists around the house and adds a nice pop of colour to any space! This set of 3 stunning grown-up suncatchers was the perfect way for us to share our love of the botanical trend with you and celebrate the sunshine. These delicate designs are the perfect way to bring elements of nature inside. Add a pop of colour to your home or desk with this amazing, vibrant rainbow foam phone holder! Claire shows us how to create this super useful craft in just 4 steps and all you need is foam, so why not give it a go?! For those who prefer more guidance, there is a video tutorial just for you! Give your craft room a spring clean and re-organise with Kathy’s DIY Craft Tidy. This handy project is perfect for keeping all your crafty essentials close to hand but keeping your desk clutter-free! It’s so simple, all you’ll need is a wine bottle carrier (you can find these for free at the supermarket) and the delightful Dovecraft Sweet Moments papers! Another trend we are absolutely loving is paint scraping! This is a super fun way to spice up your stationary and you can create so many different designs with different colours and techniques. Your options are limitless! Everyone loves a shaker card, they are a great way to add some interest to your projects. We thought we’d take it to the next level with this magical mobile wall hanging that’s bursting with sparkle! We love tassels, they are everywhere at the moment and there’s no limit to what you can do! This trendy embellishment is perfect for transforming an old makeup bag, creating a stylish and unique pair of earrings and adding interest to a celebration card! What projects from the blog have you tried this month? We’d love to know! For this month’s Craft Challenge we asked you to create the Impossible card! There were so many amazing submissions, however this card by Khawlah really stood out for us. Congratulations! Choosing the Project of the Month is always difficult as we always have so many lovely projects to choose from in the Inspiration area! However, the lucky winner is Gingers girl who created this Botanical Beauty box card - congratulations! Well done everyone...and I'm super thrilled to win the project of the month..yippee! Well done Angela, and well deserved. Congratulations to you and all the other winners. Wow wow wow!!! Thank you, we are so happy!!!!! Congratulations to all the winners. Super toucan box and impossible card ladies. Well done everyone, some great projects there. First of all a biig congrats to all the winners here, well done ladies and have fun with your prizes, and you´re in for a real treat. Sooo many gorgeous projects here this month, and I wish I had some more time to, as there was soo much of this, I wanted to try. But it´s not because I´ve been lacy earlier this year, as my granddaughter was confirmated here on April 29th, but it has been more specific work for her with invites, tablesettings, and all her own small surprises, that she needed help with, so we´ve actually been busy all the time since before christmas, but hopefully I´ll get some time to try some of all the projects, I´ve saved now, when we just get our breath back here ha ha.